Non-profits like United Way and various government agencies provide programs to support people in need. Unfortunately the people who need these programs often don’t know they exist. Every hour of every day, hundreds of people need essential human services - they are looking for training, employment, food pantries, help for an aging parent, addiction prevention programs for their teenage children, affordable housing options, support groups and ways of becoming part of their community. 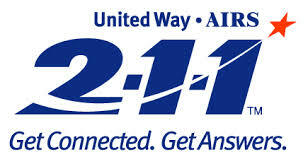 That’s why Northwest Montana United Way in cooperation with AIRS, (Association of Information & Referral Services) is working to bring 2-1-1 to Flathead, Lake, Lincoln, Sanders, Glacier, Liberty, Pondera, Sanders, Teton and Toole Counties. 2-1-1 is an easy to remember telephone number that, where available, connects people with important community services and volunteer opportunities. 2-1-1 allows people to give help and to get help. Call center specialists are trained to answer a variety of questions and callers are given confidential referrals to social service agencies, support groups, service organizations and counselors as well as any restrictions or instructions regarding available services.